Gunpowder Alchemy was an entertaining steampunk adventure. 8 years ago, Soling's father was executed by the emperor when he failed to stop England's invasion of China. Once a prominent family, Soling, her mother, her brother and their like-family nurse are now living in a shack, while Soling's mother is addicted to opium and Soling is a physician's assistant to make ends meet. When the money runs out, Soling decides to pawn one of her father's last possessions and accidentally comes to the attention of the emperor's son. She is asked to participate in the new war against the rebels and, partially, further English invasion. Soling doesn't want to help the government who murdered her father for his service, but she has no choice, and she's drawn to her former betrothed, Chang-wei. What follows next is an adventure through the ports and cities of mid-1800s China while Soling and Chang-wei try to stay alive and stop an empire from falling to war. The best part of Gunpowder Alchemy was the adventure tied in with the culture of China and the steampunk technology. There was more engineering than steampunk, but the puzzles were fun. I haven't read that many books set in China, definitely not an alternate China set in the 1800s, but it was very interesting to read about, especially the effects of the Opium Wars. It was also interesting to read a book with a non-white heroine, and seeing her take on meeting a blonde haired Englishman for the first time. It definitely made me realize how Caucasian my books generally are, and how much I need to read more diverse books. There were so many things that I take for granted and wouldn't generally notice that the Chinese culture finds offensive or impolite. A wink definitely does not mean the same thing. The characters in the book were also very much more reserved, and it was interesting to see Soling's reactions when seeing an Englishman's much more demonstrative manner. Some of the culture drove me a little crazy, especially how almost everyone was subservient to the emperor and willing to die in his service on his whim. Soling was an interesting character in that she is so reserved, but is still a strong person who is a more than a little headstrong. She is completely loyal to her family and is willing to do pretty much anything, including go on a quest for an emperor she despises, to keep that family safe. She's also very resilient and adaptable to pretty much any situation. It was at times infuriating because I just wanted to shake Soling to make her just speak her mind or act on her thoughts. I liked her relationship with Cheng, and I like that it seems to be a VERY slow burn, considering that they were engaged over 8 years prior. I like the slow burn, so this works for me. Also, it works for the story, as all of the characters and the culture are very restrained. It would not have been believable had the characters progressed past a single kiss (which was oh so sweet). 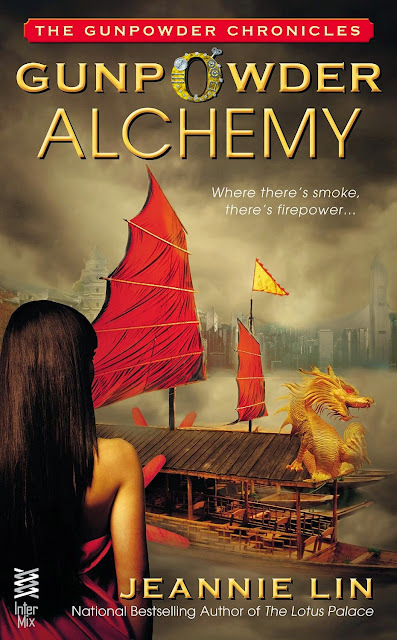 I had never read anything by Lin before, but I really liked Gunpowder Alchemy so I'll definitely be checking out her backlist. If you like steampunk, or alternate historical fiction, and you're looking for a different type of culture, you should definitely check out Gunpowder Alchemy. To satisfy FTC guidelines, I am disclosing that I each received a copy of the novel from NetGalley in exchange for an unbiased review.